“Moving Pictures”…what else can I say about this record? It’s where everything came together for Rush. In terms of song-writing, lyrics, performance and production, this would be the album that would rightfully define the band. I’ve spoken before about “microcosm songs”, meaning a song that defines Rush no matter how many new songs they write or how they progress as a band. “Moving Pictures” is a “microcosm album“, where every song is like that. Thanks to the recent “Time Machine Tour” bringing back “The Camera Eye” after an almost thirty year absence, every song has officially become a concert staple and a fan favorite. It would feature their best known song (“Tom Sawyer”), their best instrumental (“YYZ”), and be their best-selling record (being certified quadruple platinum). I’ve written before that Rush songs tend to fall into a few categories: tight songs championing the underdog and the individual, story songs that have a definite plot to them, instrumentals, light-hearted explorations of the heart and the human condition, multi-part epics, darker explorations of the human condition, and science fiction/fantasy. “Moving Pictures” contains an example of each, and perhaps the most seminal version of each song type. This is Rush’s “Thriller”. All killer, no filler. The album grabs your attention right away with Geddy Lee’s growling Oberheim synthesizer at the beginning of “Tom Sawyer”, and moves into one of Alex’s most memorable riffs. 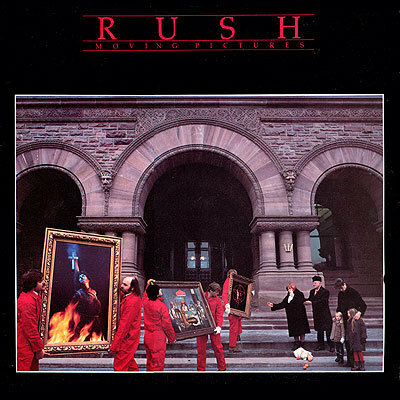 The ultimate “microcosm song” on their ultimate “microcosm album”, “Tom Sawyer” is cited as the best Rush song by fans, and that reputation is mostly deserved. It sums up all the bands’ eras and tones in one song. It’s rock, it’s new wave, it’s literary, it’s fantastical, you get a memorable synth solo along with a great guitar solo. Every instrument is clearly heard and defined in the recording, giving each band member a chance to shine. Neil’s lyrics are even at their best (co-written with Pye Dubois of Max Webster), painting a clear picture of a strong-minded individual who will not be swayed by “any God or government”. Next is “Red Barchetta”, a song tribute to the short story “A Nice Morning Drive” by Richard Foster. Rush has done many “story songs” before this, but I personally feel “Red Barchetta” is their best. The song opens delicately with Alex’s echoing notes before building to a racing adrenaline powered riff, telling the story of a protagonist who takes a “brilliant Red Barchetta from a better vanished time” from his “white haired uncle” in his “country place” to commit his “weekly crime” against the “motor law”. The song perfectly captures the exhilaration and terror of a car chase, particularly in the bridge where most of the action is described with the performance rather than the lyrics, which become very spare. I love this song so much that, to this day, the guitar solo is the ringtone on my phone. No, I’m not kidding. Every time one of you calls me, I hear the guitar solo to “Red Barchetta”. After that is “YYZ” (pronounced “Y-Y-Zed”, for the uninitiated), perhaps the band’s best known instrumental. The title references the airport code of the band’s hometown of Toronto, and Neil even taps it out in morse code on his cymbals in the beginning. It features the typical interplay between the band members (Neil and Geddy’s trade-offs on drums and bass being a highlight), and a killer solo by Alex, but what I think makes it so enduring is the tightness of the melody and rhythm. It’s an instrumental exercise, but it’s a hummable and memorable instrumental exercise. The crowd at Rush’s concert in Rio De Janerio proved this by almost turning it into a soccer chant when the band performed there. You know you’ve written a memorable melody when 50,000 crazy Brazilians are singing along to an instrumental. “Limelight” is a bit more of a personal song for the band, talking about Neil’s confusion and ambivalence towards celebrity. As he says “I can’t pretend the stranger is a long awaited friend”. In terms of memorable riffs, “Limelight” is second only to “Tom Sawyer” itself on this album. The solo is one of Alex’s all-time best, simple and emotional. The version on Rush’s 30th Anniversary tour reduces me to tears every time. “The Camera Eye” would be the band’s final song (at least to date) to reach the ten minute mark, and would only be re-introduced to the live set list on the recent “Time Machine Tour”, after going un-played since 1983 (literally before I was born). If the band had to close out the era of the ten minute epic, “Camera Eye” did it with style. Lyrically and musically, it’s one of the band’s most evocative. The lyrics are simple: the first verse describes life in New York City, the second in London, and ends with one of the most blistering solos Alex has ever delivered. Seeing this solo and this song performed in New York City on the “Time Machine Tour”, one of the cities mentioned in the song and seeing the crowd reaction, is a memory I’ll never forget. “Witch Hunt” would technically be the concluding part of Neil’s “Fear” trilogy, presented in reverse order from each subsequent album (and revisited with part four on “Vapor Trails”). It originally sprang from a notion Neil was pondering in that fear, more so than “hope” or “love”, is the primary motivator in our lives, and he began a lyrical exploration of that. Fear being used to motivate the ignorant and give rise to the mob mentality seemed to be the easiest for him to write, so he presented that part first. Musically, “Witch Hunt” is one of Rush’s darkest, with an insistent riff so ominous it sounds almost like the “Jaws” soundtrack, creating a sense of darkness and dread. On subsequent tours and performances, the band has only indulged this, making the pounding darker and harder, bordering on heavy metal for them. However, while most heavy metal bands would talk about fantastical horror, Rush makes it more palpable by talking about a horror that’s happening before and will likely happen again. It shows how mob mentality frequently demonizes “the other” (“immigrants and infidels” as the song puts it), a concept that’s easy to grasp no matter what time period it appears in. My only criticism is that the studio version ends with a bass solo by Geddy. It’s far from bad, but in live versions this is commonly replaced by a guitar solo by Alex that makes the crescendo of the song more powerful, and I personally tend to prefer that. It’s a minor nitpick though, and all versions of the song are killer. “Moving Pictures” closes with “Vital Signs”, opening with sequenced keyboards and Alex’s staccato guitar. A last minute edition and written/recorded when the album was nearing completion, the track shows the band indulging more in new wave and reggae influences than perhaps they ever have before. The lyrics are heavily science-fiction themed, starting with “Everyone got to deviate from the norm” before changing up and saying “Everyone got to elevate from the norm”. This would perhaps say more about Rush at the time than even they had predicted. They had released their most successful album with their most identifying song…but they couldn’t get complacent. They couldn’t rest on their laurels. They had to move forward, even if it meant deviating from what their fans, their record company, and even their long-time producer Terry Brown expected of them. They had grown immensely since their first record. And they had to keep growing. “Moving Pictures” itself, however, is an undeniable triumph. It’s where the stars aligned for the band and every track came out a classic. I can’t give it a higher compliment to it other than recommending to potential fans that this is where they start.